I finished another dress! Back in July I was passing Sew Make Create and did a DOUBLE TAKE when I noticed they were having a fabric sale. I couldn’t resist. I ended up buying three pieces, one of which was an interesting stretchy denim with a pintuck detail (almost like stripes). Of course, as soon as I bought it I couldn’t figure out what the hell to do with it. I knew those vertical lines would be difficult to match up. Donna came through with the best suggestion: why not make another Hazel? (I’ve made two before.) I decided to fully line the top of this one with some red voile, and I used that for the pockets as well. I had a hell of a time with the strap placement and length though, and I’m still not 100% happy with them. (I think I unpicked them three or four times.) On the plus side, the denim was so stretchy that I was able to forgo the zipper entirely. But on the negative side, I didn’t use a walking foot so the top of the bodice got a bit stretched out and gapey. I eventually settled on topstitching a line around the top to create a casing that I was able to thread some thin elastic through. That’s enough to pull the top a bit tighter around my bust and armpits. 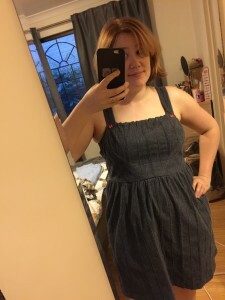 Despite all the headaches, it ended up being a very cute, functional sundress!